As many of you know Sue Crabtree aka "Anon Mom" has passed away. Sue has helped many people over the years, too many to count. 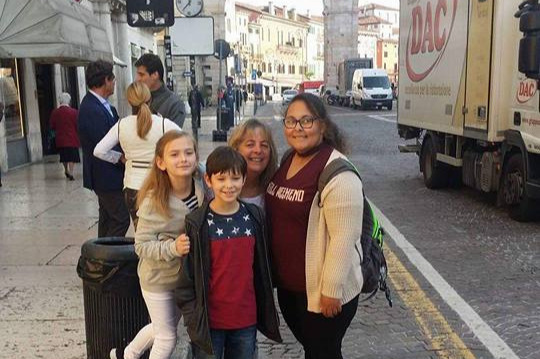 Her family is now in need of some help making travel arrangements and such in Italy. ANY amount is helpful! Please do what you can to help someone that has helped so many others over the tears. To Sue and the family, you are all loved, and Sue you will be missed! Sue was like a mother to me over the years, as she was to so many other people I know. Anytime you had a problem, Sue was there for you. I can't remember how many times my phone rang and it was her crazy voice going about how someone was arrested unfairly, or in need. Taking in anyone that needed a place to stay, giving up pieces of herself and her family to help anyone she could, even to the detriment of her own health and sanity. If you were in trouble you know Sue was always there for you. Dancing for Anons, doing the teapot dance, shoes, whatever means necessary she did anything in her power to help her friends and family. Through heartbreak and tears I write this, I'm still in shock she's not here. To everyone in her family, know her memory will be cherished by so many, and so many people are here for you guys.